Aberfeldy is found at the heart of the Perthshire Highlands, the area is home to Perthshire's highest mountain, deepest loch and longest glen. Many outdoor recreation activities are available in Aberfeldy, as well as whisky tasting and tours at the Dewar's World of Whisky. Visit the Scottish Crannog Centre, and find out how Loch Tay used to be home to many Scots who used the loch as part of there defence. In the evenings, Aberfedly is a popular spot, with many pubs and restaurants offering traditonal Scottish hospitality. Deep in the heart of Perthshire highland, sits the delightful village of Aberfeldy, Scotland. Somewhat set away from the major A9 route, the village is less touristy than the rest of the highland villages. Yet, it offers some of the most beautiful views of the area. Aberfeldy is situated on the upper south side of River Tay in the Tay Valley. Being on the floor of the valley, the terrain is pretty gentle and the soil fertile, making this area lush. Farming and agriculture is the main industry in the village. However, just a little bit further north and west of the village is the extensive mountain range of the Grampians. The stunning views of the peaks of Farragon, Creag Odhar, Schiehallion, Sron Mhor and Ben Lawers punctuate the landscape. Aberfeldy history is also very much intertwined with the history of distilling. It was common in the highlands for many of the enterprising Scots to keep their distilling activities secret to avoid paying tax. However, with some changes in the legislation in the first half of the 19th century, legal distilling became more attractive and a number of distillers were opened in Aberfeldy and the surrounding area. Aberfeldy Distillery was opened in 1898 to replace the Pittiely Distillery that closed in 1867. Dewars World of Whisky in Aberfeldy is worth a visit to discover more about the history of distilling in the village. 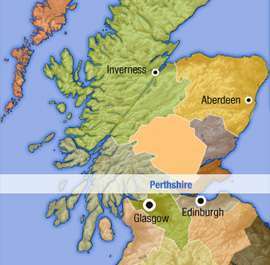 For a small town, Aberfeldy offers visitors a wide range of attractions and activities. While in Aberfeldy, you can also walk on the world’s first bridge entirely made of engineered materials, the Aberfeldy Footbridge. Another local attraction in the area is the Black Watch monument. The Black Watch is Scotland’s most senior regiment. The town also has an 18-hole golf course and a children’s park. The square has a good selection of shops, restaurants and art galleries. The locals are very friendly and Aberfeldy hotels offer visitors a very warm welcome. In the southern outskirt of Aberfeldy is the Birks of Aberfeldy, a famous gorge with scenic walking trails and home to a variety of plants, tress and wildlife. The Birk is a ‘site of special scientific interest’. Visitors can enjoy a variety of outdoors activities like kayaking, canyoning, off roading and the fairly new activity in Scotland, Duckying. It’s a cross between canoeing and water rafting. If you are intrigued about it, then it’s definitely worth a visit to Aberfeldy. Welcome to the Aberfeldy in the heart of Highland Perthshire. There is something for everyone in Aberfeldy - adventure, cultural, wildlife and of course relaxation!.